This may not be the best approach, but I figured I’d document the process that I go through, especially because it turns out there’s some hidden gotcha’s that took a bit of sleuthing to figure out. 1: Fire up IntelliJ and select New Project from the File menu. 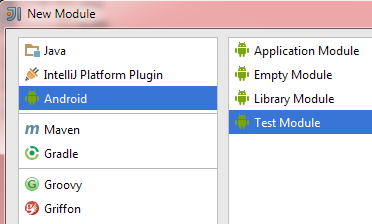 For there, select Android from the list on the left, and “Application Module” from the list on the right. 5: If you haven’t done so, and you’re using an actual Android device, connect it and wait for the “AutoPlay” dialog to appear. I learned that this may take a while — under a minute, but still I learned that you have to wait for this to happen before the IntelliJ will talk to the device. Once the AutoPlay dialog appears, close it. 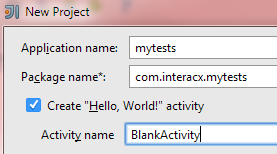 Finally, you can write some tests. Tests must being with the word “test”! That’s it! 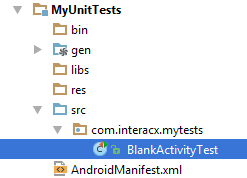 Happy unit testing on Android using the IntelliJ IDE.